MINNEAPOLIS – When Meredith Aby met with members of the Revolutionary Armed Forces of Colombia in 2006, she asked what it would take to get them to stop fighting. Jess Sundin did the same during her trip to Colombia 11 years ago. They returned and openly wrote and spoke about their experiences, while criticizing the U.S. government’s involvement in that country. FBI documents recently found by the anti-war activists suggest the trips may have started an investigation into apparent connections between local activists and radical groups in Colombia and the Middle East. One document says the probe expanded to include 16 people in six states. “I believe those types of reports and public speaking that I did is what has landed me in the heart of this investigation,” Aby said Wednesday. Since Sept. 23, people in Minneapolis, Chicago and Grand Rapids, Mich., have been subpoenaed to appear before a grand jury in Illinois. 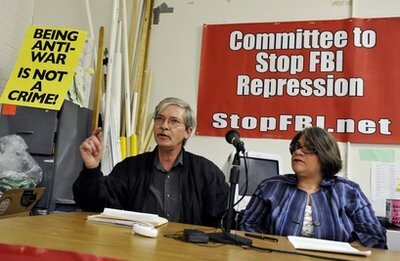 Sundin said FBI agents searched the Los Angeles home of another activist Tuesday. The FBI in Los Angeles did not immediately confirm that account. Authorities haven’t revealed the targets of the investigation or its exact nature, other than to say it involves activities concerning the material support of terrorism. No one has been charged. None of the activists have testified before the grand jury. The documents were found at the Minneapolis home of longtime anti-war activist Mick Kelly on April 30 and given to The Associated Press this week. Kelly’s home was among those raided by the FBI in September. Kelly said agents went through thousands of files at his house, emptied drawers and cabinets and took away boxes of materials. When his partner was recently looking through a file cabinet, she came across the FBI documents, Kelly said. FBI spokesman Steve Warfield said most of the papers appeared to be legitimate FBI documents and were left behind by mistake. The activists condemn the raids and subpoenas as harassment and an attempt to stifle their rights to free speech and assembly. They have held several news conferences and rallies in protest. Sundin said the group chose to release the documents because they provide a glimpse into the origins of the investigation. Subpoenas have only hinted at the sort of evidence authorities were seeking. “This is the first confirmation we have of what the government is thinking, where this investigation began and how it expanded outward,” Sundin said. Warfield had no additional comment. Randall Samborn, a spokesman for the U.S. attorney’s office in Chicago, also had no comment. The documents, which are not labeled as classified, suggest that activists’ involvement with people in Colombia sparked the investigation. Sundin said her trip to Colombia did not involve passing money or weapons to FARC, but visiting the people and understanding some of their demands. At the time, FARC was negotiating with the Colombian government. Sundin said she took a Columbia military plane to a small, demilitarized town where peace talks were being held. She said people traveled to the area by busload. Aby said she went to Colombia in 2004 and 2006 to meet with people affected by war. On her second trip, she had the opportunity to meet with people in FARC and discuss what it would take to bring peace. “It has enriched my activism and my ability to really be an expert in the anti-war movement in Colombia, and I don’t think it should be used as probable cause for an investigation of me,” she said. The documents given to the AP also include a strategic plan for the FBI’s raid, a subpoena, and a list of questions that agents would presumably use in an interview. Warfield could not immediately verify that the questions — which were typed and not on an official law enforcement document — were from the FBI. The subpoena, which was made public previously, orders Kelly to appear before a grand jury and bring information relating to any trips to Colombia, the Palestinian territories, Jordan, Syria or Israel. It also commands him to bring records relating to the Middle East and Colombia. One document labeled Kelly as “dangerous” and said he had weapons in his house. It noted several agents were involved in the raid and gives detail about the weapons and ammunition they carried. Kelly said he has a rifle and a handgun, and both are legal and were not seized. The document also says Kelly has offered to provide weapons training to other activists, which Kelly said was untrue. The activists also took issue with the list of over 100 questions in the documents. The top of the list says the questions “pertain to a terrorism investigation.” Many deal with activities of the Freedom Road Socialist Organization, to which Kelly and Sundin both belong. The group, named in several warrants, shares the Marxist ideologies of FARC and PFLP. Two groups use the name. Kelly and Sundin have said their Freedom Road is smaller, and Kelly edits its newspaper. Appeal for Support- Honduras Vive! The FBI and ICE have a draft agreement that allows them to provide biometric information to a deportee’s country of origin upon repatriation, potentially putting people at risk of ethnic cleansing and discrimination upon returning to an oppressive or violent government.